We are a family owned and operated business located in the heart of Virginia, the historical "moonshine capital of the world", Franklin County. We take pride in the fact that 75% of our sales are generated by word of mouth. The outside wood furnace units we carry range from 100,000 B.T.U. 's up to and including two and half million B.T.U.'s. We do a multitude of shows each year, the largest being the State Fair of West Virginia held annually Lewisburg. For additional information about shows that we do, please contact us. Our office is located on Virgil H. Goode Highway (U.S. Route 220 North) between Boones Mill and Rocky Mount, Virginia, 24151. Since our customers are also our sales people, we try to stay in touch with them via email or by phone. This helps keep them aware and up to date on any new products or changes in existing stoves and or parts. In this industry, manufacturers are always striving to make it better for the consumer. Increases the value of your furnace. Heats water quicker and helps maintain temperature. No more stopping to clean out a firebox. Simply remove a few scoops of powder when needed. Smoke and fire tends to go away from the door when opened. By keeping the firebox empty the ash pan stays dry helping eliminate corrosion. Mix coal with your wood to extend burn time. Burn wood chips of all sizes. walls, a center I-beam, and a steel plate that lays on top of the I-beam and rails and locks them together. The grate slides in between the I-beam and rails. The system comes with its own scoop shovel. of it, you'll need only a bucket. Jewell has sold and installed outside wood burning furnaces for more than 28 years, and in that time has handled most major brands. 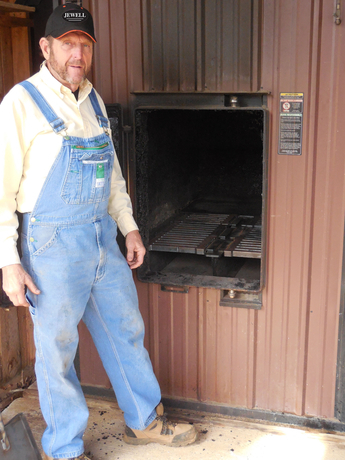 "When you install furnaces for that long, you find all kids of ways to make them more user friendly," he says. "We've tested out new grates for more than 5 years with local Central Boiler customers to get their feedback and have had an overwhelmingly positive response." The grates are designed for Central Boiler's 5036, 6048, 7260 furnaces, as well as the Pallet Burner. Prices range from $1,250 to $1,860 depending on the furnace model.